Looking for fun, attractive candy for your store display or concessions stand? Our wholesale Ford gum candy meets the mark! 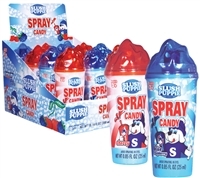 The classic Ford Gum offers so much more than just gum; they are also the creators of the famous summer drink Slush Puppy, Icee Squeeze Candy, Icee Spray Candy, and more. Who doesn’t have fond memories of grabbing a flavored Slush Puppy drink to cool off after a day at the pool? The line has since expanded to include fun items like the Icee Squeeze Candy, a liquid candy in a tube that kids are sure to love. Of course, Ford Gum also sticks to its roots with delightful, colorful gumballs. In addition to the Slush Puppy classics, we also offer bulk gumballs at amazing rates, in the standard sizes and flavors for gumball machines. Indulge in some fun with our wholesale Ford Gum candy line! Order today for unbeatable deals and free shipping on qualified orders! Satisfy your craving for coolness with our Slush Puppy Squeeze Candy! This classic Slush Puppy Squeeze Candy features thick gel with a smooth texture and delicious taste along with a convenient screw-top/flip lid. Flavors includes Cherry and Blue Raspberry. Smarties flavored gel candy in a squeezable tube.